It’s been a big week or so. Twelve by Twelve has an exhibit at the Australasian Quilt Convention in Melbourne right now. All I had to do was mail my quilts to the appropriate place and Brenda took care of the rest, but it’s been great fun to hear her and Kirsty’s reports from the scene! Closer to home, I have been working on the Hawai’i Quilt Guild’s annual show. I’m the show chairperson this year, though the real work has been done by all my great committee volunteers. The show is from April 30th until May 9th, so if you’re on Oahu, please take the time to go see it. The show has been getting rave reviews from guild members and others alike. Last Thursday was the opening reception which is always nice since one of our members always makes sure there’s a good spread of food and wine and entertainment. The challenge quilts are judged and ribbons placed, and everyone gets a first look at all the quilts. 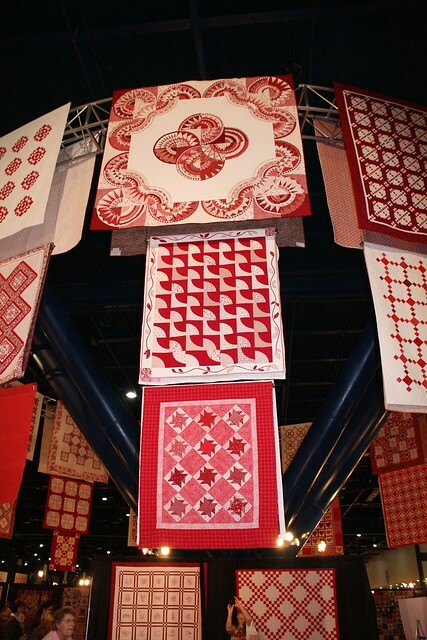 This is not a juried show — it is a celebration of all levels and all types of quilts made by guild members. 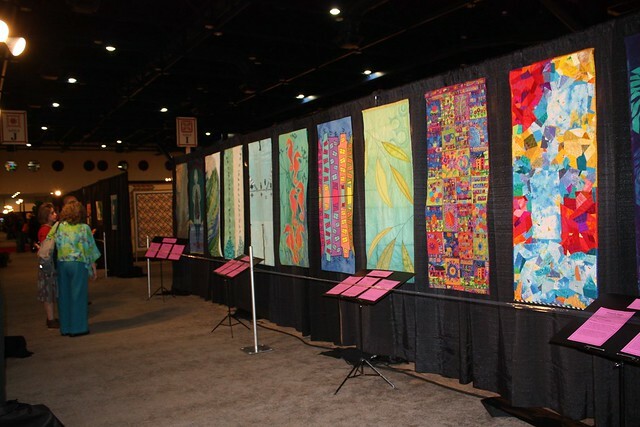 This year we had more quilts entered than ever, which we take to mean that members appreciate the venue and the opportunity, which is a good thing. 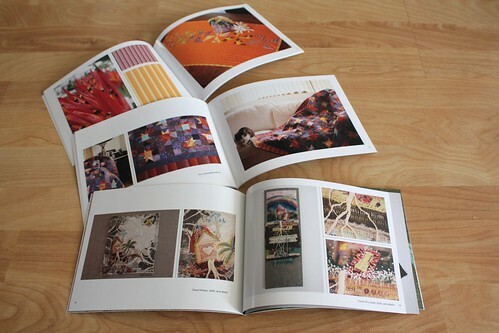 Besides, we’ve got plenty of quilts to be proud of. Me in front of the Art Center’s Linekona gallery. A peek at the yummy food on the lanai from the first photo. This year’s Featured Artist, Patricia Lei Murray, and I welcoming everyone. The info table and the opportunity quilt (someone will win this at the end of the show). Hawaiian style entertainment from the Murray ohana. Local students played their music for the second hour. Signing teh guest book and reading our quilter bio book. 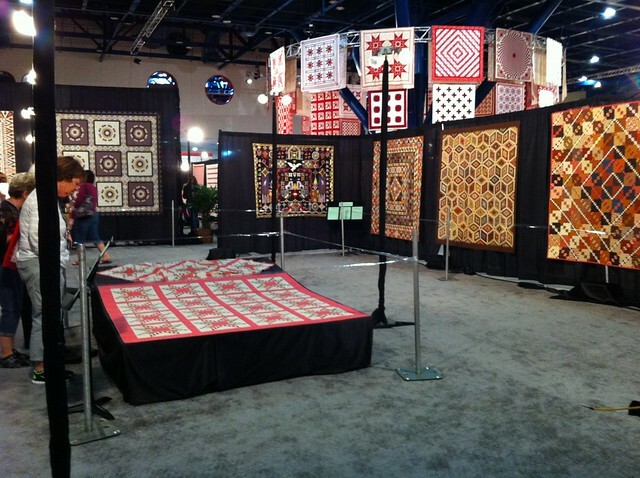 Lots of quilts to look at. And even more to see. 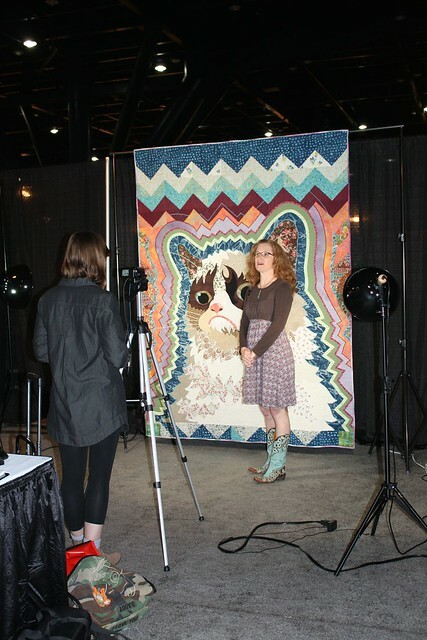 The quilt/craft blogs have been a-flutter for the last few days with all the Quilt Market excitement. Maybe some day I will be able to attend as an exhibitor or retailer and join in all the fun (and hard work!). I’m not holding my breath though. On Thursday, the Market turns into the Festival, which IS open to the public. This I would also like to attend someday — which actually could happen. For now though, I am content that at least one of my quilts is there. 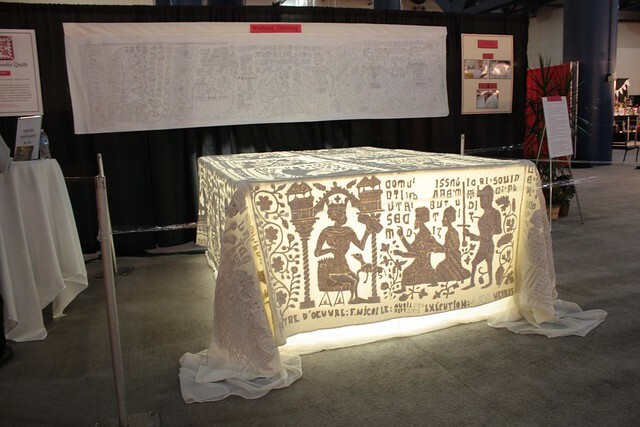 If you are at the Festival, please stop by the Tactile Architecture exhibit and say hi to my quilt!